3331 Arts Chiyoda invites you to the residence program studio for a presentation of artwork created over an intensive period of stay, research and production in Tokyo. Les attentes--The Waiting is a series of installations in which Evelyne Leblanc-Roberge portrays places of unexpected encounters and discoveries where tension and boredom cohabit: waiting rooms. From doctor offices to airports, she documents and examines the architecture of various waiting rooms and uses these spaces--real and/or restaged --as sets for fictional stories and actions, investigating their potential to unfold in places of both the everyday and the extraordinary. 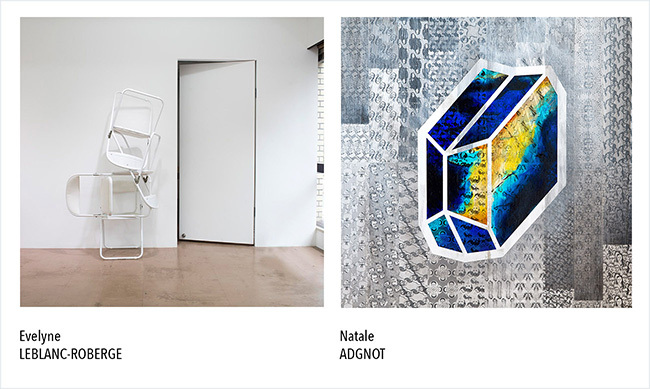 Natale Adgnot's Minerals are a mash-up of pop culture, scientific data and the raw beauty of stones. Her large acrylic paintings show minerals against the backdrop of accurate scientific data, only reinterpreted as metaphorical scales of human traits. Each property of the mineral is represented by the face of a widely recognized personality. Originally conceived of through the lens of an American point of view, the Minerals series has been redeveloped using faces that are famous in Japan, proving that regardless of culture, a cliché, a stereotype or a façade always hides something more complex.